Brightech’s science-fiction-inspired Eclipse LED Floor Lamp lands nicely within contemporary dwellings as well as humble abodes. The innovative LED lamp’s adjustable double rings encircle your domain with power-saving LED light while creating mood-enhancing ambiance. A dimmer on the power button brings you three levels of lighting to choose from: bright enough to read by or a choice of two softer tones. Tap or press firmly to achieve your desired setting. The Eclipse is available in a silver or black finish. What’s in the box and how does it all fit together? The outer container measures 21″ wide by 25″ in height with a 3″ diameter. Carefully packaged and sealed cardboard with protective inserts are inside holding the heavy weighted base, power cord, the lamp stem in four sections (sheathed in plastic) with the electrical cord already threaded through the pole, as well as the dual orbs. A vertical tier of four cubes unites the two rings on a single spoke. No screwdriver necessary! The base has a detachable black cap atop the base screw, remove this round sleeve to begin assembly. Insert bottom pole section (the one with a power jack attached) and tighten by turning counter-clockwise, then repeat with each adjoining pole section. To situate the top pole, adjust the interior wire by pulling gently on power jack from the bottom pole, the wire retracts! Lamp head has another round black cap to remove, then tighten orb fixture with counter-clockwise turns until secure. With both rings upright, the Eclipse stands approximately 75″ or 6 1/3 feet tall. Assembly takes approximately half an hour, depending on how briskly one approaches the task! After assembly, adjust rings up or down for a delightful sci-fi atmosphere enlightening your living room or spaceship cockpit. 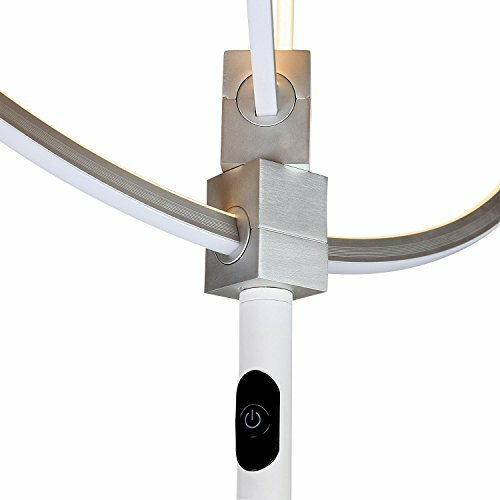 Position near reflective surfaces such as mirrors or sliding glass doors to create an illusion of multiple orbs within orbs!BEAUTIFUL LIGHT TO BRIGHTEN UP YOUR SPACE: Like a pair of shining halos, the twin rings of the Eclipse Floor Lamp provide bright LED lighting for any room or office space. 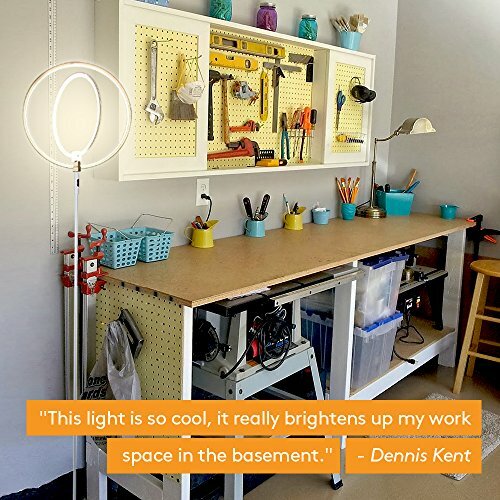 Its 2,000 lumens and 3,000 kelvin color temperature shine bright warm light that will lighten even the darkest dungeon like spaces so that you can create a well lit easy to work in environment in any room. 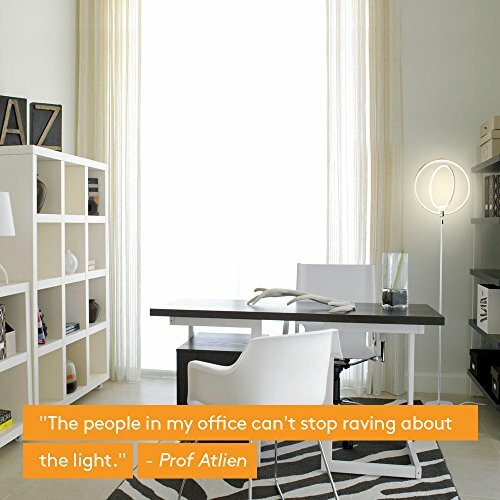 The warm light will fill your living room, bedroom, or office with warm white light while you read, work, or play. 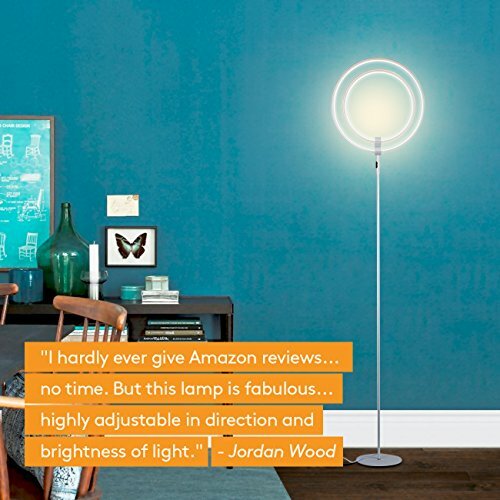 LONG LASTING & ENERGY SAVING FLOOR LAMP: The Brightech Eclipse LED Floor Lamp includes two circular rings with 28 Watts of long lasting, power saving LED light source so that you will never have to replace the light. Its advanced LED technology allows it to outshine lamps that depend on short lived, energy consuming standard halogen or incandescent bulbs. This LED lighting will endure for more than 20 years without burning out or overheating. 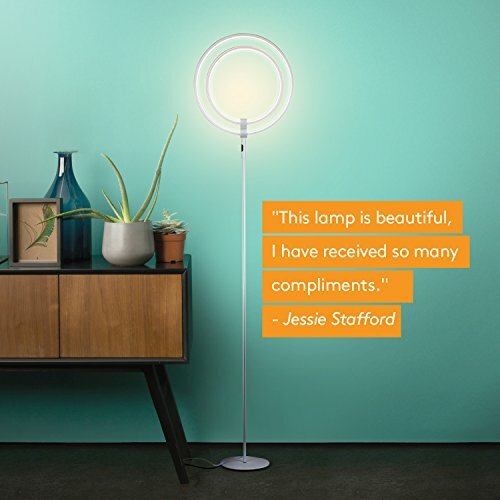 Save money & energy with the Eclipse LED Floor Lamp. MODERN STYLE AND FUNCTIONAL DESIGN: The unique, modern style of the Brightech Eclipse Floor Lamp will amaze and impress all of your guests. The Eclipse floor lamp looks great in bedrooms, living rooms, dorms, and offices with modern décor. Its slender design makes this futuristic lamp the perfect choice for small spaces that need a dimmable bright light. The outer ring is 18 inches and the inner ring is 14 inches in diameter and both are adjustable. 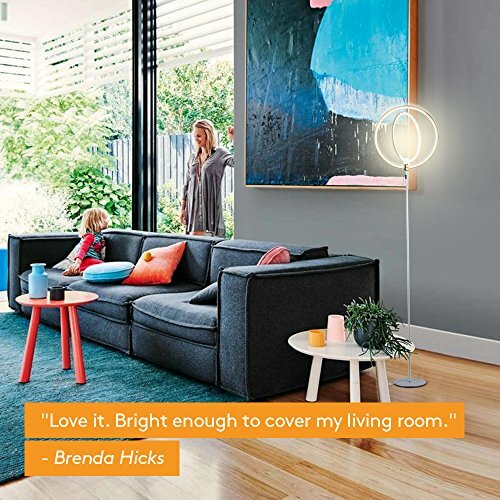 DIMMABLE & ADJUSTABLE FLOOR LAMP: This floor lamp has a convenient built in dimmer button that allows you to alter the brightness of the beams. 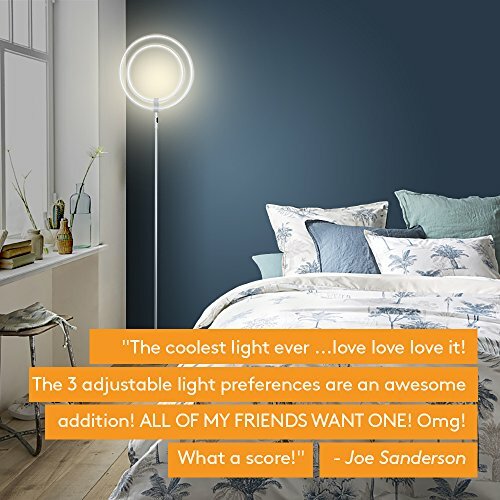 Select among 3 different light levels ranging from super bright to soft, ambient mood lighting so that you can attain the perfect lighting for your space. The two rings are adjustable so that you can aim light in any direction. 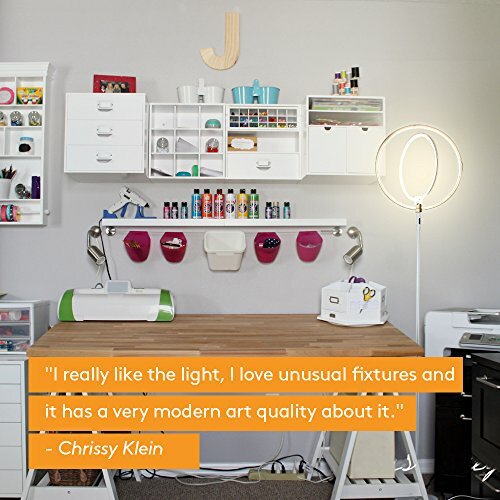 The range of lighting makes this lamp perfect for reading, watching movies, drawing, arts and crafts, and studying.